I recently had the privilege to visit a spiritual community focused on the controversial Latin-American folk saint known as Santa Muerte. ‘Holy Death’ as she is known has become an emblematic symbol commonly associated with narcotics, drug cartels and various expressions of deviance and criminality. While these associations have become popular in the American consciousness, they represent a minority of devotees that have appropriated a very traditional form of spirituality that is practiced around the globe among law-abiding, family oriented and community conscious individuals. Las Vegas Nevada is home to a community of believers who gather weekly in the sanctuary of Santuario De La Santa Muerte. The small but resilient house of worship is located in a largely Hispanic residential community in the city of Las Vegas. The church was established in October of 2010 when minister Elva Morales felt the call to create a place of worship for Santa Muerte. Morales had an extraordinary series of spiritual experiences with the folk saint beginning in her childhood. Her grandmother was a well-known ‘curandera’ or traditional healer in Juarez Mexico who shared many of her traditional practices with her daughter. Elva shares that she began to hear messages from various spirits and that at one point she almost became overwhelmed with the number of spirits speaking to her. At a young age Elva was invited to train under the guidance of a ‘Santera’, a traditional priestess in the Afro-Cuban religion of Regla De Ocha also known as ‘Santeria’. She shares that this allowed her to gain knowledge in how to listen and communicate with spirits that were speaking to her. Over a period of several years, Elva received formal training in a number of African, European and Latin based esoteric traditions. Several years later Elva was diagnosed with cancer after she says that Santa Muerte told her to insist on getting tested. It was at this time that she began having dreams about Santa Muerte. The image would appear in various dreams and visions offering hope and guidance during this difficult time. Elva says that she would pray to Santa Muerte and eventually received healing from the power of the saint. Elva continued to pray to Santa Muerte seeking guidance and provisions. Elva says that despite common beliefs that Santa Muerte wants to take people’s lives, Elva claims that “She doesn’t want to take us, she wants to guide us”. Elva decided to establish a shrine dedicated to the Holy Death who she calls her ‘showgirl’ and ‘La Flaca’. She rented an abandoned office building and converted it into a temple for Santa Muerte. As word began spreading throughout the local community, followers of Santa Muerte began to show up at her shrine. In 2012 the church began to conduct services centered around the worship of Saint Muerte. Today the church is recognized by the state of Nevada as a non-profit and faith based organization. Santuario De La Santa Muerte is located in a small inconspicuous building that has no signage that would indicate the presence of a church. However, a series of esoteric symbols decorating the perimeter of the building on the walkway speaks of something spiritual in the area. The doorway is decorated with ornate colorful images of symbols commonly associated with Santa Muerte. Grinning skulls and ornate owls adorn the doors to the church while a protective mirror stands at the doorway turning back negative energies and those with ill intent. Upon entering the sanctuary visitors can take a seat among the numerous congregational chairs decorated with skeletal images. The light from the outside beams in through a window decorated with the same skeletal face. Walls to the sanctuary are decorated with images of various cultural personalities related to death. Elva holds her hand out toward the front of the sanctuary and exclaims “This is all for her. It is all for her!” The front of the sanctuary is an exhilarating visual of statues, sculptures, altars and offerings. The central figure standing almost 10 feet tall is a massive statue of the Holy Death. Covered in a shimmering silver dress and adorned with a copper colored crown, the image is breathtaking. The towering icon holds in one hand a globe, a set of scales, an oil lamp and a giant sized iron key. The east side of the sanctuary contains a number of display shelves filed with various images of the saint. Various colors, sizes, shapes and styles of Santa Muerte can be seen in dresses, robes and even riding on horseback. One particular image features the saint holding a flaming sword. Elva shows me a bone colored image of the saint and tells me that the statue is the oldest image in the church. It was purchased in Mexico in the Seventies and was given to her by someone close to her. A wooden table can be seen to the right of the massive central statue. The table serves as an altar. Elva advises me that it contains elements that are necessary in the proper worship of Santa Muerte including a glass of water, a piece of bread and a bowl of black salt. Black salt that is blessed by Santa Muerte can be placed in water to create holy water used in rituals for protection and consecration. A small wooden bowl can also be seen on the altar containing various materials for financial matters. The bowl contains American currency, Mexican pesos, luck coins from the local Chinatown and gold painted beans. Several bowls of oranges and various pieces of fruit are seen in bowls and baskets in front of the main statue. The west side of the sanctuary contains similar display cases with many of the saint images belonging to members of the church and local neighborhood. Elva explains that many of Santa Muerte’s followers cannot keep shrines in their home because of either limited room for a shrine or because of chastisement from family and friends. Some of the statues have names attached to them on pieces of tape and paper. A glass cabinet containing numerous crowns is kept along the wall to the left of the main statue. The bottom level of the cabinet is filled with a colorful display of multi-colored glass skulls containing colored water. Elva tells me that the skulls originally contained alcohol which was an offering for the Holy Death. When the church first opened they were fined by the city for keeping a large amount of alcohol without a license even through the spirits were not being sold or distributed for consumption. Santuario De La Santa Muerte conducts weekly services for followers on Tuesday and Wednesday evenings. Rev. Elva as well as two male assistants lead services for the congregation. Many of the practices found in the church are practiced in Mexico among various Santa Muerte congregations as Elva learned throughout the years. Many of the practices are codified in the booklet ‘Santo Rosario De La Santa Muerte’ written by Rev. Elva and used as a sacred text by the congregation. Prayers to Santa Muerte are made by members of the congregation as they sit in chairs in the sanctuary or many pray in the close proximity of the main statue. I observed several members standing before the central statue, bowing humbly and placing a hand on the globe of Santa Muerte as they prayed. Some placed requests and offerings in envelopes into the scales of the statue. Elva advised that all materials including offerings to the church are kept in the presence of the image for twenty-four hours as a way of demonstrating respect to Santa Muerte. Group prayer is also led during services by Elva. Candles are presented to Santa Muerte by members and non-members of the church. In some cases Elva provides an interpretation of how the candles burn as they are believed to manifest various spiritual phenomena. Elva shows me video on her phone of a candle with a burning wick that is engulfed in a growing flame and is crackling. She advises me that this was a situation where Santa Muerte was verifying that a member of the church had been cursed by a particular person in the community. I was invited to participate in one of the church’s weekly services while visiting the area. I took my seat in the congregational seating area. All of the members of the congregation that were present were of Latin-American heritage and were between the ages of 9 and mid-60’s. Dress was casual and the atmosphere was light-hearted amidst laughter and hugs between congregants before the service started. There were several members that approached the central image of Santa Muerte and offered prayer during this time. One member brought a small statue with him and placed it in the presence of the central statue. Elva explained that some members bring their images of Holy Death into the presence of the central image to give them energy from her statue. One of the church assistants known as a ‘warrior’ began a cleansing of the sanctuary by walking around the perimeter of the sanctuary with a censer filled with burning incense. Elva advised that the resin known as copal which is sacred to Santa Muerte along with Myrrh and a few other herbs were being used in the cleansing ritual. The assistant wore a green colored cloth around his shoulders as he opened the service. Some members bowed their head during this portion of the service. A member of the congregation handed out copies of the book Santo Rosario De La Santa Muerte to the congregation. After introducing me to the congregation she begins the service. Elva goes before the central image of the Holy Death and prays before she turns and faces the congregation. Rev. Elva begins the service with an invocation. She first asks God the Father for permission to invoke Santa Muerte. The invocation includes prayers to Santa Muerte regarding appreciation, protection and praise. A song for Holy Death is performed that thanks her for her love and peace. A male and female member of the congregation take turns reading the rosary dedicated to Santa Muerte as the congregation responds and repeats using the booklet. The service continues with numerous prayers and songs dedicated to the Holy Death. Praises are spoken to a number of saints and spiritual figures including the Virgin de la Caridad del Cobre and the angels. The service is closed and various community announcements are made by Elva. Offerings of fruit are placed in a basket in front of the image of Santa Muerte. Elva advises that the energy from the fruit is given to the saint and that fruit is typically left for 24 hours. After the food can be given to visitors and church members. Elva recalls one occasion where an apple flew out of a basket and landed at the foot of a member that Santa Muerte had been speaking to. Elva notes that petitions are placed in the scale of the central image but items that will be given indefinitely are placed on the hand of Santa Muerte. The image holds pieces of jewelry, iron keys and a lantern. Some members have even donated vehicles to the church as an offering to Santa Muerte. The ceremonial dressing of the central image of Santa Muerte in Santuario De La Muerte is a significant ritual. The folk saint is adorned in a variety of ornate dresses and crowns. The crowns are interchanged and are custom made for the church. Elva advises that Santa Muerte chooses her crown and in on occasion has made specific crowns physically move to indicate that she wants to wear them for a season. The church operates a small religious supply store inside the building to provide various articles used in the practice of the religion. Amulets, booklets, incense, jewelry and statues of the Holy Death are available to the congregation. Elva provides religious based counseling to members of the church as needed as well. The church was visited several times when it first opened for operation back in 2012. Local police and city officials visited the church based on allegations that a church for a ‘narco saint’ had appeared in town. Elva shares that initially things were rather tense between the church and officials but that now the relationship has improved after the city has seen that the church is not a hub for drug traffickers. There is a cliché saying in the world of Social Media where some people describe their personal relationship with someone by saying “It’s complicated”. It would be easy to simplify the meaning behind the Santa Muerte culture as simply representing death, narcos or folk religion. Many of these interpretations fit into a neat box that fits a specific worldview. 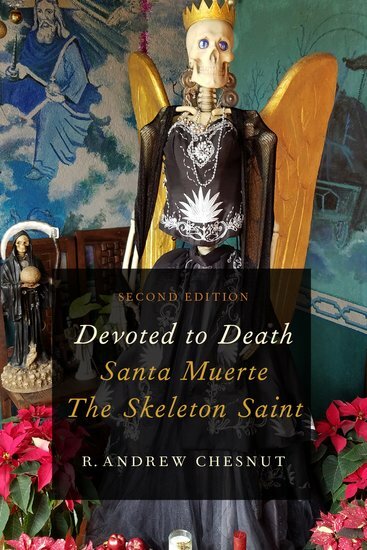 As we look at the depth and the complexity of the role that Santa Muerte plays in the lives of her followers, we can no longer place her culture into a box as we paint the images of her followers with a broad paint brush. It’s not that all of her followers are following death, are narcos or are even folk devotees. It is that she is available for everyone from every background. Like those social media relationships, it’s complicated. Tony Kail is a cultural anthropologist, ethnographer and writer. Kail has been involved in research of religious cultures for more than twenty-five years. His work has taken him from Voodoo ceremonies in New Orleans to Spirit churches in East Africa. His most recent book, A SECRET HISTORY OF MEMPHIS HOODOO: ROOTWORKERS, CONJURERS AND SPIRITUALS, was published by The History Press in early 2017. He is a cultural consultant for local, state and federal medical and public safety agencies on issues related to cultural diversity, religious culture and transcultural communication. He has lectured at more than one hundred universities, hospitals and public safety agencies throughout the United States. Kail was raised in Memphis Tennessee. Featured image courtesy of El Santuario de la Santa Muerte’s Facebook page.